According to VW, a new Golf has been sold every 41 seconds since 1974. 2019 is a landmark year for Volkswagen for several reasons. Not only does it mark the launch of its first electric ID model launching later this year, but also the 45th anniversary of one of its most iconic models: the Golf. While the Beetle is being killed off, its Golf successor remains in production today at VW’s plant in Wolfsburg, Germany and is about to enter its eighth generation. To celebrate this milestone, Volkswagen is looking back at the original Golf and has revealed some interesting statistics. According to Volkswagen, more than 35 million units of the Golf have been sold through seven generations. Staggeringly, this means a new Golf has been ordered somewhere in the world every 41 seconds every day, without interruption, since production started 45 years ago. That is an average of around 780,000 vehicles per year. In the US, more than 2.6 million Golf models have been sold since 1974 since the first one was sold in December 1974. In the US, the current Golf is available in S and SE trims. Both are powered by a 1.4-liter engine producing 147 horsepower engine, paired with either a six-speed manual or an eight-speed automatic transmission. 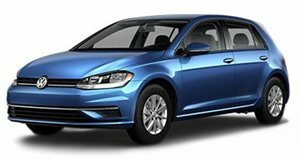 Standard tech includes Volkswagen Car-Net App-Connect, Forward Collision Warning and Autonomous Emergency Braking with Pedestrian Monitoring (Front Assist), Blind Spot Monitor, and Rear Traffic Alert. Sadly, the new eighth-generation Volkswagen Golf will miss the 45th anniversary of the original. It was originally going to debut at Frankfurt in September, but VW has delayed its reveal until 2020. Based on spy shots, don’t expect the design of the new Golf to be a drastic departure from the current model.